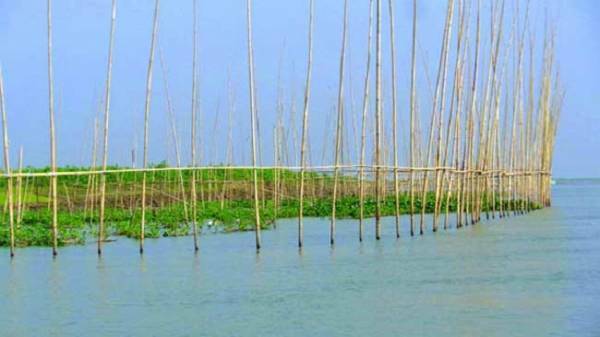 About 50 kilometers of Sunamganj’s Surma and Dhanu rivers are under-occupiers. And the rivers occupy is increasing day by day. In this, boat movement is disrupting and fishermen are being deprived of fishing. The rivers’ boundary that are in possession-- Jamalganj Upazila’s Lalpur, Laxmipur, Rampur, Jamlabaj, Gazaria, Kamdharpur, Alipur, Amanipur, Bishnupur, and Dhamapasha Upazila’s Golokpur, Babupur, Chadra, Shoytankhali, and Khaliajur Upazila’s Nautana that is conncted between Sunamgnaj-Netrokona, Jagannathpur, Asadpur, Rajibpur, Lipsabazar, Shibir, Shaldigha, Harakandi, Pathra, and Mohonganj Upazila’s Gaglajur Bazar, Mandarbari, Gaglajur New Bazar. To make fishing in these parts, the tree-bamboo perimeter have been made for catching fish. As a result, the movement of the boat is interrupted. And due to this, the accident or obstacle is happening. Anil Barman of Fenarbank UP of Jamalganj, Joy Mohan Barman, son of Hari Das Barman of Amanipur village, Samer Barman, Rana Barman said that they are running family by laboring in the other person’s house by leaving the ancestor’s profession. Those who have money and muscle power, they are occupying river, haor, bill. Farmer Ali of Gazaria village said that due to lack of excavation of Surma and Dhanu rivers, the river was filled. “Now, the fishing places are in the hand of the influential people. Large boats cannot run properly on the river. If the excavation is done in Surma and Dhanu rivers, then we do not have to worry about the fish, including the protecting the haor,” he said. “Effective steps will be taken very soon after discussing the eviction drive for the removing river occupiers with the senior authorities,” said Mohammad Mostafizur Rahman, deputy director of the BIWTA’s Ashuganj-Bhairab Bazar River Port. Jamalganj UNO Shamim Al-Imran said that legal action will be taken after inspection.